Mysuru: There is an urgent need to create awareness among people to protect environment in the current situation and ban usage of plastic. 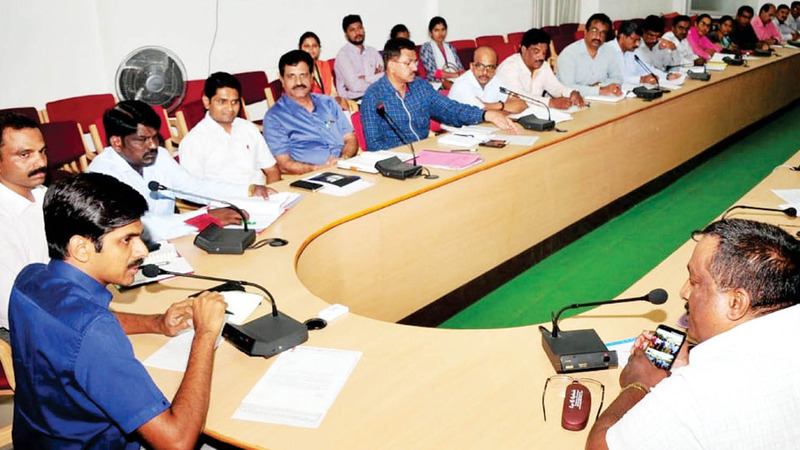 Hence, the officials of various Departments should chalk out programmes in the month of June, said Deputy Commissioner (DC) Abhiram G. Sankar. He was chairing a preliminary meeting yesterday at his office and giving directions to different Departments to come out with innovative programmes to highlight the importance of environment protection in view of the World Environment Day. India is the global host of 2018 World Environment Day which will take place on June 5. With “Beat Plastic Pollution” as the theme for this year’s edition, the world is coming together to combat single-use plastic pollution. A jatha should be organised in schools and colleges to highlight the harmful effects of usage of plastics and importance of environment protection. Essay and painting competitions must be organised for students and prizes given, he said. Focus should be on creating awareness about the ban of plastic on forest fringes and the Rural Development and Panchayat Raj Department must take up this work. The cleanliness drive must be conducted in the eight major temples identified by the Muzrai Department, the DC said. Wherever the villages are located on the banks of the rivers in the District, awareness must be created among the villagers to prevent the river from becoming polluted and the local populace and voluntary organisations in cities must take up this responsibility, he pointed out. Since rainy season has started there is fear of outbreak of epidemics like Malaria, Dengue and other communicable diseases and the cleanliness programme must begin from the hospitals itself by maintaining hygiene in the premises, he said. The District Administration in association with Karnataka State Pollution Control Board (KSPCB), Regional Office and other local organisations has organised a cleanliness drive of Kapila river and cycling event has been organised on June 5, he added. Deputy Conservator of Forest (DCF) Dr. Hanumanthappa, MCC Commissioner K.H. Jagadeesh, ZP Deputy Secretary Shivakumaraswamy, Karnataka State Pollution Control Board officials B.M. Prakash, M. G. Yatish, Joint Director of District Industries Centre (DIC) H. Ramakrishnegowda and others were present at the meeting.